There are few greater joys in a home cook’s life than when a first time recipe turns out really, really well. And this is a recipe that turned out really, really well. It’s a “pound cake” type of dessert, meaning it could be eaten by itself (tomorrow I’ll probably call it breakfast) or you could top it with 100 different things. 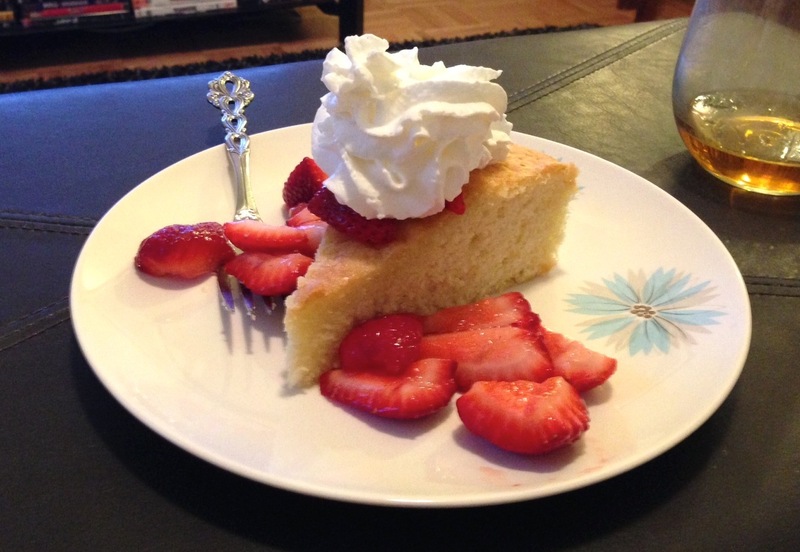 For a pre-Father’s Day dinner with my dad last night I served this cake with fresh strawberries (tossed with a little white sugar for sweetness and to bring out the juice) and topped it with whipped cream. But you could do lots of different things: top with lemon curd, drizzle dark chocolate over each slice, or add any kind of seasonal fruit. The sky is the limit. Preheat oven to 350 degrees. Grease and flour a 10″ cake pan (I used a 10″ tart dish and it came out beautifully). In a medium bowl, whisk together the melted butter, olive oil, and milk. In a large bowl, beat together the eggs, zest and sugar with an electric mixer until the mixture is light and frothy, around 3 minutes. While your mixer is still beating, alternately add the dry flour and wet butter mixtures, starting and ending with the dry ingredients. Mix until completely combined. 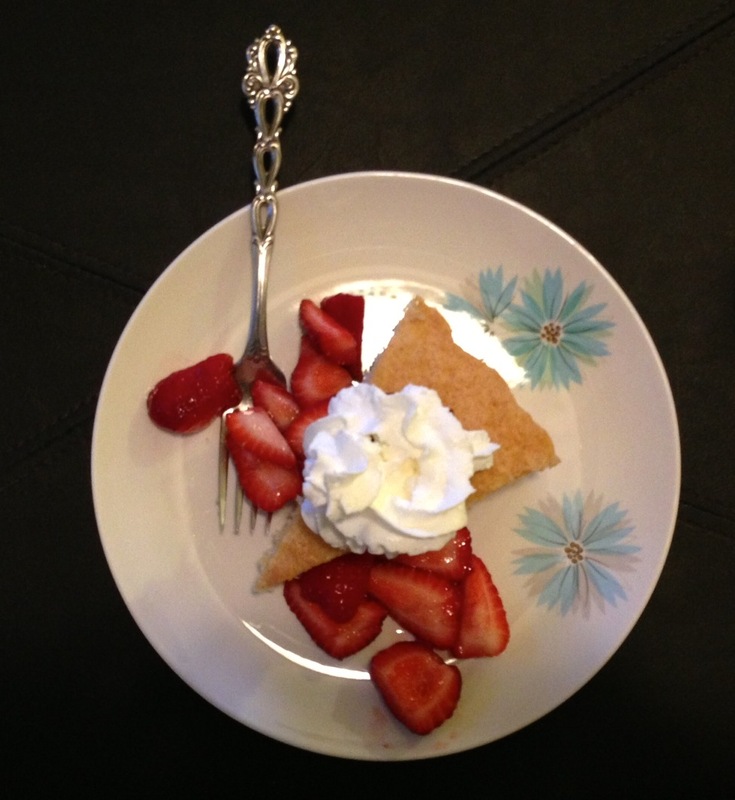 Pour into your prepared cake pan and tap against the counter top a few times to release bubbles. Bake for 30 – 40 minutes (see note below). Let cool on a cooling rack for at least 10 minutes before serving. 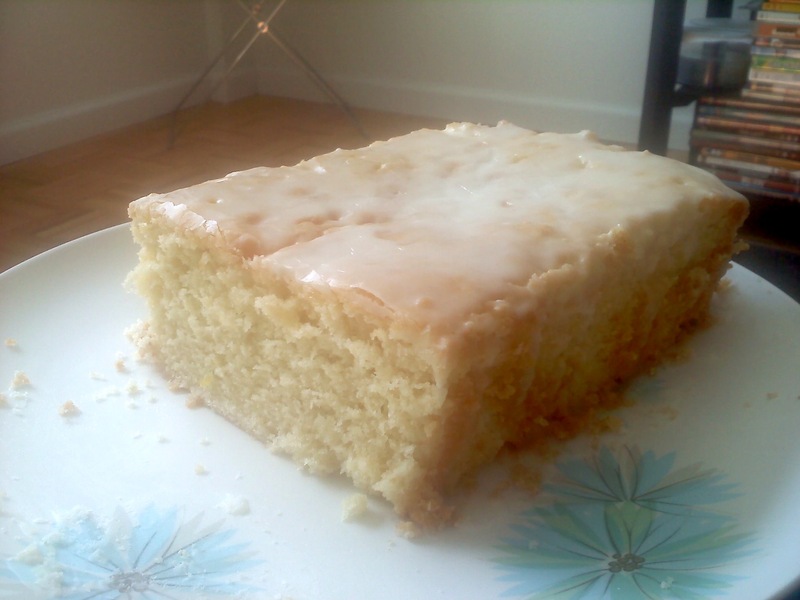 This cake will also keep for around 3 days at room temperature. Cut into wedges and eat alone or top with whatever topping your little heart desires. *I used regular old olive oil but you could use virgin or extra virgin olive oil if you want to. Just know that the heavier the oil, the heavier your batter will be and a cake made with olive oil might have to cook just a bit longer. Test the doneness of your cake by pressing down on the cooked cake gently with your finger – it should spring back when it’s fully cooked. One problem with being home all the time now is that I want to bake all. the. time. On my kitchen counter right now I have M&M cookies, unfrosted cupcakes in anticipation of a ladies’ lunch tomorrow, and a citrus cream cheese loaf that The BF asked me to make last week. I should invest in some sort of healthy eating cookbook or something. In any case, this cake is not healthy by any means but for some reason it screams “brunch!” to me. How much less healthy could it be than cinnamon French toast or something? That’s my rationale and I’m sticking to it. Note: this makes an awkward amount of batter, and you’ll have enough batter for one loaf cake and 8 cupcakes. Just go with it. Preheat oven to 325 degrees. Grease and flour a 9 x 3 x 4 pan. Put 8 cupcake liners in a cupcake tin. Cream together cream cheese and butter with an electric mixer. Add sugar and blend to combine. Add eggs one at a time, blending after each egg is added. Blend in vanilla until combined. In a separate bowl, whisk together the flour and baking powder and salt. Add zest and whisk in. Slowly add dry mixture to wet mixture and stir by hand just until combined. Do NOT overmix. Pour 2/3 of the batter into the loaf pan. Divide rest among the cupcake cups. Bake cupcakes for 25 minutes; bake loaf cake for 60 minutes. Tip: set the timer for 25 minutes and put cupcakes and loaf in together. Once the timer goes off, take out the cupcakes and set the timer for 35 minutes to finish off the loaf. Let the cakes cool and then make the glaze. Stir together the powdered sugar and the citrus juices. Remove the cakes from their respective pans and put the loaf on a plate, the cupcakes on parchment paper to catch the drips. Pour 3/4 over the cake and dip the cupcakes in the remaining glaze. Let the glaze harden and enjoy. NOTE: This recipe originated here and here and the first one calls it a Philly Fluff. Does that name tug at your heart strings? Tell me why! I’m from upstate New York and have no idea.